After The Crash by Michel Bussi has been huge hit in France, where it was originally published, despite Bussi’s previous novels being relatively moderate sellers. The story begins in 1980 with a plane crash in the Alps in which every passenger is killed and their remains burnt to ashes – except for a baby girl who is discovered at the very edge of the wreckage, alive and unharmed. The problem is that there were two baby girls travelling with their respective parents on the flight from Turkey, and in the days before DNA testing, there is no obvious way to determine which one the miracle is. Is she Lyse-Rose de Carville, born into an immensely wealthy and powerful family? Or is she Emilie Vitral, whose working-class socialist grandparents scrape a living selling chips and crepes from a van on the seafront at Dieppe? Judges eventually come to a decision, but can ‘Lylie’, whose hybrid nickname is a constant reminder of her uncertain origins, ever be certain that the ruling was correct – and what effect has all this had on those who may or may not be her surviving family? Her possible sister Malvina de Carville is desperate to the point of madness for Lylie to be her sister, while her potential brother Marc Vitral, in a complicating twist, is equally desperate for her not to be his. The gradual unravelling of the 18-year-mystery of Lylie’s identity takes place from multiple points of view, including long sections told in flashback in the notebooks of Credule Grand-Duc, a private detective engaged by the de Carvilles to uncover the truth. After The Crash is without doubt a gripping thriller. It’s full of twists, murders, thwarted love affairs, unlikely alliances and a race against time (and across France) that features a particularly awkward road trip undertaken by Marc and Malvina. As a page-turning beach read, it’s a winner. It is also, however, absurdly improbable – something that’s even acknowledged at times by the characters, as Marc wonders aloud why Grand-Duc’s notebooks are presented in the style of a fictional whodunnit (or who-is-it) instead of an investigation report. Some of the cliffhangers are so contrived as to be absurd – pages ripped from files only to finish mid-sentence just before the truth is revealed, and so on. There are endless implausible complicating factors, unlikely stumbling blocks, perfectly-timed interruptions and repeated coincidences. According to the blurb on the front of the book, The Sunday Times compared After The Crash compared to the work of Stieg Larsson, and although I don't think the comparison stands up to much scrutiny, I can see where it's coming from. 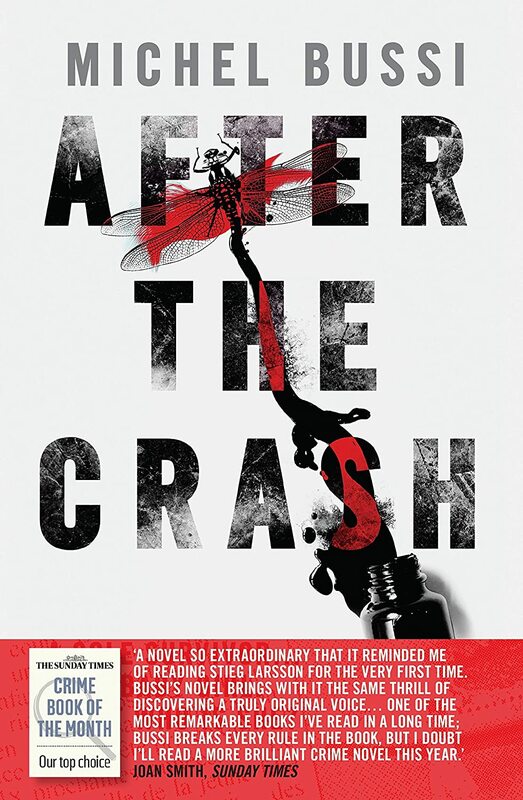 After The Crash is very, very French in the same way that The Girl With The Dragon Tattoo is very, very Swedish. More to the point, both of them have some impossibly larger than life characters and plots that are, while deeply engaging, essentially barking mad. It’s always hard to review the quality of the prose itself in a translated novel, as it’s difficult to know what idiosyncrasies are the author’s and which are the work of the translator. There are plenty of sentences in After The Crash that seem clunky and amateurish to me, including some misplaced melodrama which almost made me laugh. However, the primarily colloquial, no-frills style does make for a very easy, fast-paced read. In short, this is a highly entertaining read if you disengage your brain before you start. I did, and I enjoyed it. You just have to be happy to go along for the ride.